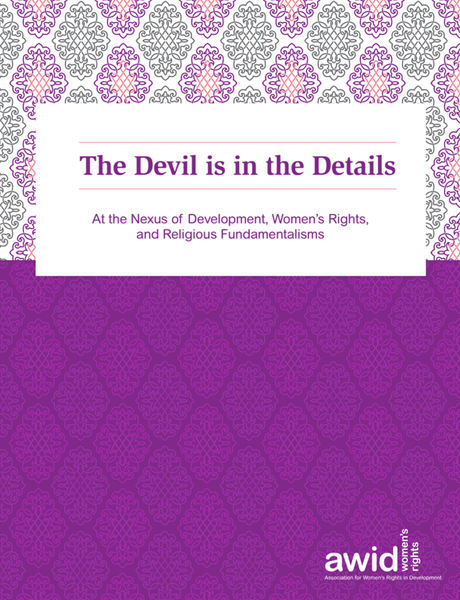 Our research paper examines the relationship between development initiatives, the growth of religious fundamentalisms, and the state of women’s rights. "At the nexus of development, women’s rights, and religious fundamentalisms"
The paper addresses knowledge gaps around religious fundamentalisms within the development sector, and aims to improve understanding of how religious fundamentalisms constrain development and women’s rights in particular. It provides recommendations for ways development actors can avoid inadvertently strengthening and instead challenge fundamentalisms. Globally and in every religious context there has been a growth in the power and influence of religious fundamentalist actors. Although the violence that they are wreaking on women’s rights and human rights may differ and manifest in specific ways depending on the context, it is clear that this escalation is taking place across the world. The paper presents a global picture of rising religious fundamentalisms. It details the grave human rights violations, and violations of women’s rights in particular, caused by state-sponsored fundamentalism, as well as by fundamentalist non-state actors such as militias, religious community organizations, and individuals. The control of women’s bodily autonomy is a hallmark of fundamentalist ideology that crosses religious boundaries, and is central to the way that fundamentalist ideologues exercise power. Religious fundamentalisms have particularly high costs for women and girls. Fundamentalist reinforcement of regressive, patriarchal social norms are leading to the rise of violence against women, girls, and women human rights defenders (WHRDs). Religious fundamentalisms are gaining ground within communities, political systems, international arenas with devastating effects for ordinary people, and for women in particular. There is an urgent need to act. It is vital to promote intersectional feminist understandings of power and privilege, and to apply these to questions of religion and culture. Development actors can promote positive inclusive identities to counteract the bounded, othering identities fostered by fundamentalists. By prioritising progressive partners for their activities, development actors can avoid giving resources or legitimacy to religious fundamentalists. Women’s organizations already have knowledge and strategies to counter fundamentalisms--development actors should build on this, and invest in cross-issue coalitions to help them reach new heights.